My husband is an Eagle Scout who spent lots of time backpacking throughout Virginia; thus, he digs camping. I didn’t last a day in Brownies back on my native Long Island and have never actually been camping. Now, while the notion of telling ghost stories around a fire, playing music, roasting hot dogs, and making s’mores appeals to me, the idea of spending the night in sleeping bags and tents does not. No AC, no running water, no bathroom? No thank you! So the question looms: how can my husband and I enjoy the great outdoors together? Glamping! Glamourous camping combines the best in modern luxuries with rustic settings and views aplenty, and Virginia is home to several properties that each has its own unique (and posh) spin on the glamping concept. Sign me up! The Primland Resort in Meadows of Dan is known for its remarkable 12,000 acres of secluded Blue Ridge mountaintop complete with top-rated cuisine and first-class service. Over the past several years, guests have had the chance to take advantage of the resort’s newest accommodations: three luxury treehouses. Primland vice president Steve Helms says the idea came from one of the resort’s owners who knew Mr. Alain Laurens, famous for his treehouse work in Europe. Laurens, who has built more than 200 treehouses throughout Europe, accepted the invitation to visit the resort and look for a great tree to use as the first treehouse. This project at Primland became Laurens’ first treehouse project in the U.S. He designed and built the Golden Eagle house for Primland in 2011. “It was constructed in France and shipped to Virginia in two containers, and it took only two weeks to reconstruct the treehouse on site,” says Helms. All three treehouses are located at the end of a ridge point with a view of Kibler Valley 1,500 feet below. 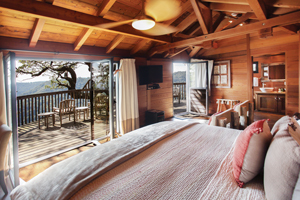 According to Helms, the treehouses are “great for couples looking for a peaceful getaway or for celebrating a special occasion. The deck is also a perfect spot for a proposal or writing the next best seller!” Guests stay upwards of 1,300 feet high and enjoy privacy and stargazing in addition to having access to all of the amenities of the greater resort. Bring the kids to Primland, but not to the treehouses, since children are not permitted in these accommodations. Also, the treehouses are closed in January and February. Ever since I saw A River Runs Through It, I thought fly-fishing looked like fun (and no, it wasn’t just because I was a teenager and the film featured a young Brad Pitt). What looks like even more fun to me is staying in one of the new, modern yurts at Rose River Farm in Syria, Virginia. Fly angler and outdoorsman Douglas Dear purchased 20 acres in the Rose River Valley (two hours north of Lynchburg) about 10 years ago and transformed it into Rose River Farm, a nature retreat for lovers of fly-fishing and the great outdoors. Guests stay in one of several yurts, which are circular tents typically made from canvas or wood that perform well in high wind terrains. Yurts originated in Mongolia, but Dear first saw them on a fly-fishing trip to Patagonia. “I liked them, and I kept thinking about them when I came back to the States. I just loved all the space that they offered—there’s no wasted space at all,” he explains. Dear wanted to offer his guests the opportunity to stay in a yurt. “With our mountain views, they would fit the site really well, but with our climate in Virginia, canvas would get mildew,” he says. He contacted a company in Washington State that fabricated alternative yurt components, and a local contractor assembled them. Each 1,100-square-foot yurt is made from steel and 2,500 separate pieces of cedar hand cut to fit. They feature full kitchens, Wi-Fi, and high-end club furniture. Fly anglers from around the world come to enjoy the Farm and families can fish on the stocked catch and release pond (or even take private fly-fishing lessons). If you don’t fish, don’t worry—you can still find immense enjoyment at Rose River Farm. Couples and families come to hike Old Rag Mountain, check out the wineries, or just kick back and read a book and relax. “We supply firewood for the fire pits every night, and that just becomes a big family event,” Dear says. Make your reservations several months in advance and up to a year ahead of time for the October and November season. When people hear that I’ve never been camping, they ask, “Would you stay in a cabin?” Evidently, cabins are the gateway to camping, and I’d be up for a weekend at a cabin for sure. 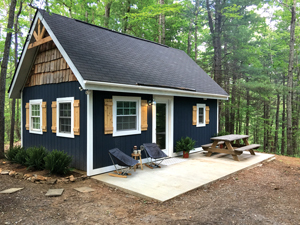 One stellar example is Tim and Cindi Spaulding’s adorable tiny cabin in Big Island. A few years ago, the Spauldings were hiking in Bedford County and started wondering what land would cost up near the mountains. They stumbled upon an old hiker’s loft that was in rough condition and thought, “Could we make it work?” In order to purchase the 2.5-acre property, they’d have to delay their planned kitchen renovation. “We decided to go with it and have some fun,” explains Tim. The Spauldings and their three young children spent every weekend up at the house, completely renovating the whole thing. “It was really a team effort,” he says. Because the Spauldings originally purchased the cabin to use as a family getaway, they didn’t spare any expense or overlook any detail. However, it is a “tiny house,” with just 308 square feet of living space. To make it work for their family, “we decided to maximize the space as much as possible,” Spaulding says, so they deliberately designed the home to be bright, airy, and functional for everyday living (such as including a washer/dryer). The cabin is open year-round, but plan on making a reservation at least three months in advance in order to accommodate your desired date. You can find the Spaulding’s cabin on Airbnb: Airbnb.com/rooms/18385835. For the past six years, outdoor enthusiasts have been taking advantage of the canopy tours, paddle boating, and mountain biking at Sandy River Outdoor Adventure and Retreat in Rice. With grounds that highlight a 3-hour tree top adventure (complete with tight ropes, swinging bridges, and zip lines), accommodations ought to fit the scenery. Interested guests can choose to stay in a cottage, one of the rustic log cabins, or one of four luxury tipis on the property, which are the newest additions to Sandy River. That’s right: a luxury tipi. (It’s not an oxymoron.) Each comes with radiant heated floors, AC, a kitchenette, queen-sized beds, and a full bathroom. They also feature Wi-Fi and televisions with Netflix as well as fire pits, picnic tables, and grills. The tipi fabric does not block daylight, so plan on waking up with the sun. A tipi rental also gives you 20% off on any adventure activities you book during your stay.